Construction is about to begin in Florida on the long-awaited luxury underwater hotel. Yes, it is a luxury hotel. And it is underwater. It is called the Planet Ocean Underwater Hotel. It will sit 8.5 meters (28 feet) below the surface of the water, and remarkably, it can even move to avoid storms—it’s not just underwater; it’s mobile! The hotel will be moving from one location to another and has even invited every Caribbean island nation to register and provide a mooring locations for the hotel. Interestingly, the hotel is technically classed as a vessel, because it can navigate ocean waters using electromechanical propulsion technology to seek shelter under its own power in the event of a hurricane. Each room will be air-conditioned and have WiFi. 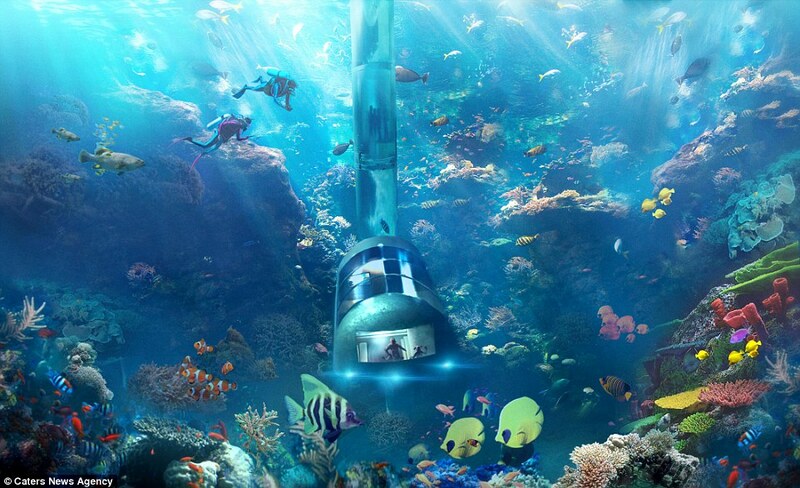 The Planet Ocean Underwater Hotel was originally supposed to be called The Poseidon Underwater Resort. An unfortunate similarity to a popular 1972 disaster movie called The Poseidon Adventure may have prompted the name change. After all, when trying to sleep under the ocean, who wants to think of a bunch of people drowning on a boat that flipped upside down? The project is being funded by Tony Webb, a space tourism entrepreneur who is also backing the SYNERGY MOON project, which is competing for The Google Lunar X Prize to get a robot to the moon. The new underwater hotel is part of Webb’s larger philanthropic plan of restoring coral reefs worldwide. Webb plans to do this by using a Biorock process of shooting an electric current through seawater, creating limestone upon which corals can flourish. Of course, there is some debate about just how viable this technology really is, but it is an interesting concept—one that the team plans to move ahead with now that they have the proper approval and paperwork. But planning on visiting yourself? Rooms will cost between $3,000 and $6,000. If you prefer, you can purchase a single unit Planet Ocean Underwater Hotel and place it in an approved location for docking. That will set you back $3 million. The 12-room design is priced at a whopping $20million (or over £13million).